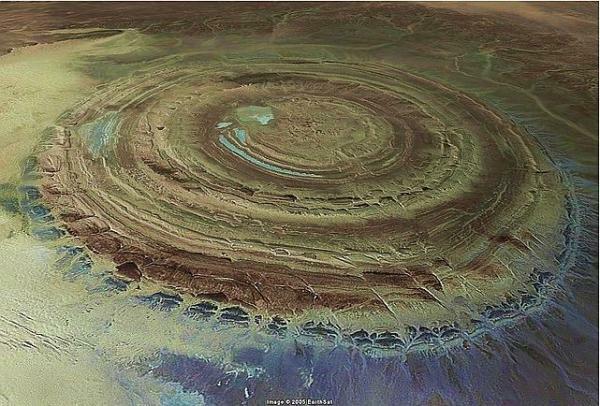 Formally known as the Richat Structure, the Eye of the Sahara is a much more appropriate name. This mysterious blue eye has puzzled scientist since the first space flights, when astronauts noticed it looking back at them. Space shuttles use the 50 km-wide feature as a landmark even today, it is so clear in the middle of the barren Sahara desert. Researchers now believe it is a “symmetrical uplift”, essentially an area that rose up as hard quartz while softer rock and sand was eroded from it. 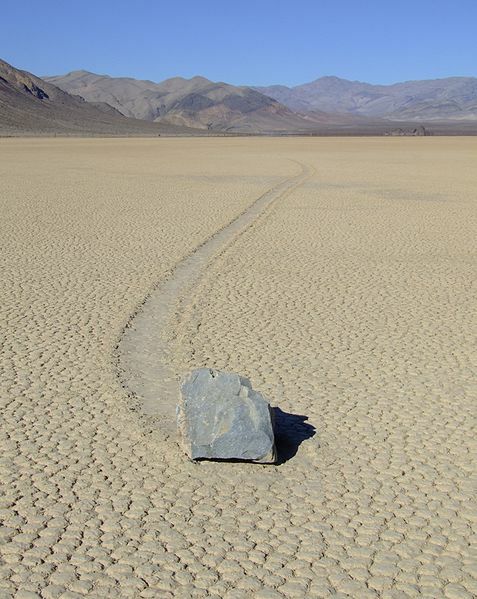 This mysterious and ghostly phenomenon occurs at Racetrack Playa, Death Valley which is a fitting location! The stones travel long distances without any human or animal help! It seems as if they just lift themselves up and scoot along, making a trail or groove in the rock surface as they travel. Scientists’ best guess as to why this happens at present is that wind at the level of the stones causes them almost to hydroplane. Sometimes they turn left or right, and other times it looks like two stones are racing each other. They only move every three or four years and the grooves take some time to build up. 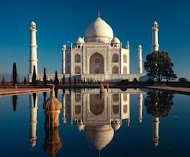 Definitely a wonder of the world! 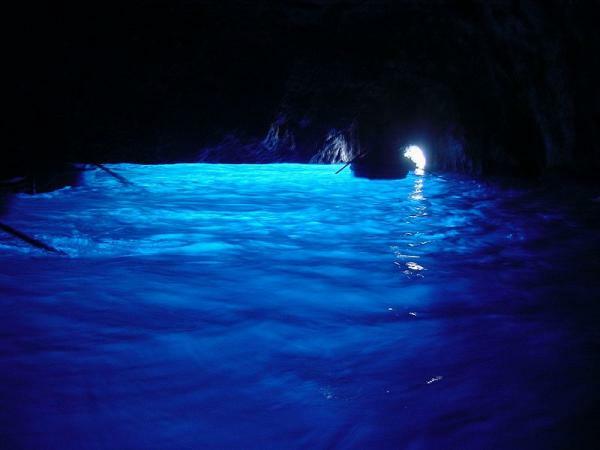 The Blue Grotto in Capri is a gorgeous cave with a brilliant blue color to it due to two separate sources of light. One is tiny, the opening you can see in this picture which allows small rowboats in. 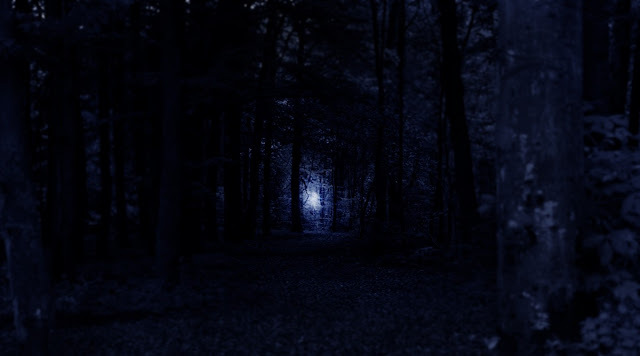 The other opening is much larger and beneath the first, sending in rays of light into the cave from below. Of course, it is more difficult for this second hole to allow light through as it is underwater, but its size makes the difference. Standing in 90 degree heat on huge logs of crystals, one might indeed be in a giants’ showroom in Chihuahua, Mexico. Dwarfing humans in size, these are the largest crystals of selenite ever found. The heat inside comes from magma under the floor of the cave, and it was magma-heated water that once filled the whole space. 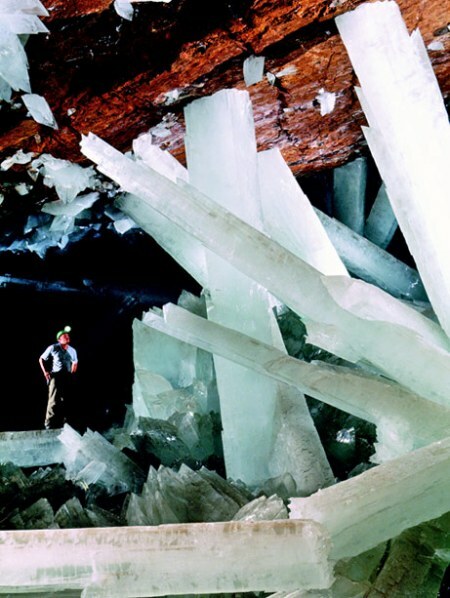 As a result, it became rich in minerals like gypsum, causing the crystal logs to form. Because of the heat and humidity, scientists can’t spend more than 10 minutes at a time in the cave without suffering ill effects, so it is no wonder tourists won’t have the opportunity to visit in the near future. 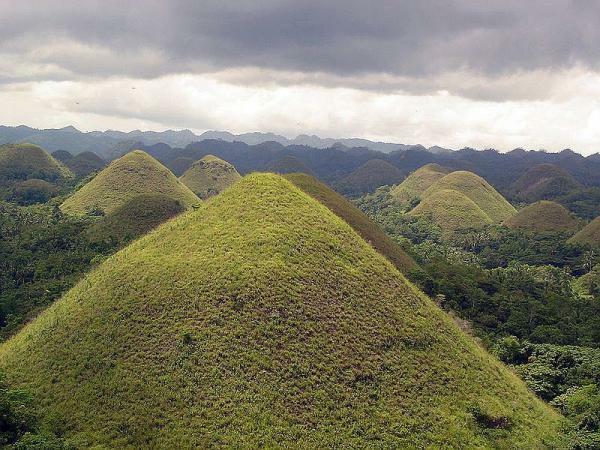 The Chocolate Hills in the Philippines are named for their resemblance to Hershey kisses during the dry season when the grass is brown. With estimates of up to 1,776 of these amazing mounds – actually called haycock hills – they make a spectacular landscape. When visiting, you are standing on millions of years’ worth marine limestone, which contains fossils, old coral and mollusks! They were created by erosion from above and below by water after they had been lifted up from sea level. This incredible rock is found in Hayden, Australia. 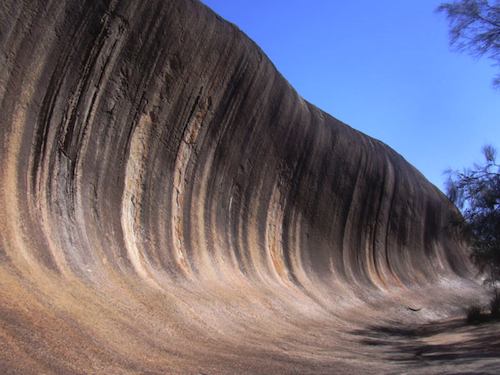 It looks like the earth sculpted a breaking wave and put it down on the land – which is almost exactly what happened! The rock, composed of granite, formed by a process of erosion while still underneath the earth 60 million years ago! As the earth exposed more of the area, it finally came into view to amaze and delight us all. 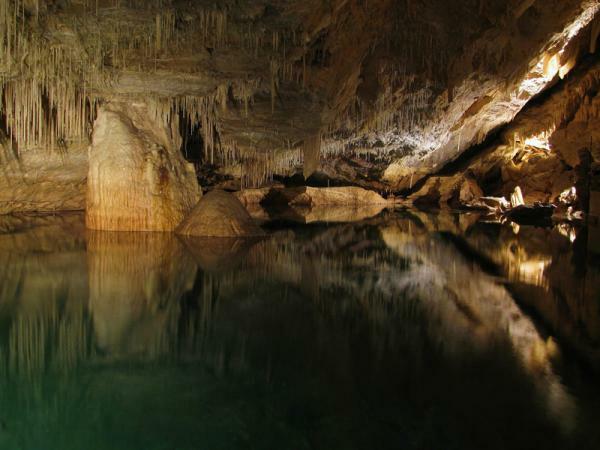 Many know of Crystal Cave in Bermuda but few know of her sister cave, Fantasy. As beautiful as her sibling, she is also deeper. There are 88 steps down into her cavern. The authorities had to close the cave for a long time in the 1940s, but it was reopened with all new lighting and pathways in 2001. Bungle Bungles (a great name!) 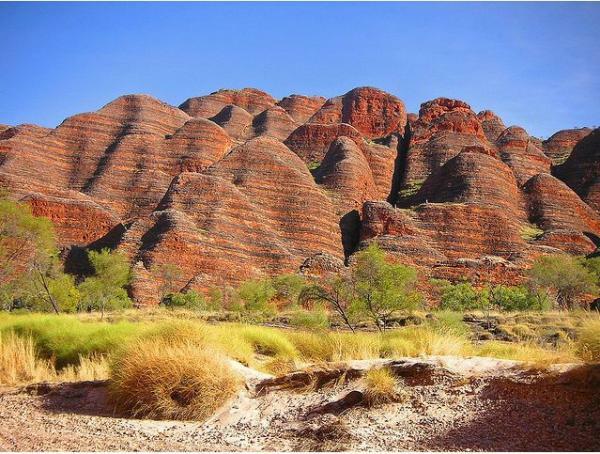 are found in the the Purnululu National Park in Western Australia, also a World Heritage Site. They are beehive shaped mounds with tiger striping caused by bacteria growing on the gray stripes and iron manganese on the red. They’re an incredible sight, looking like the condominiums of giant bees as big as helicopters! 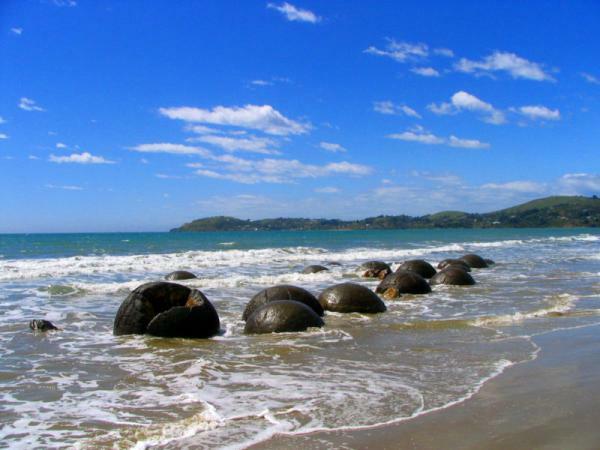 The Moeraki Boulders are amazing boulders found on the New Zealand coast. They are highly spherical in almost all cases and were exposed due to erosion and winds. As with many geological wonders, you would be excused for thinking that giants have been there, playing marbles as they crash among the waves. 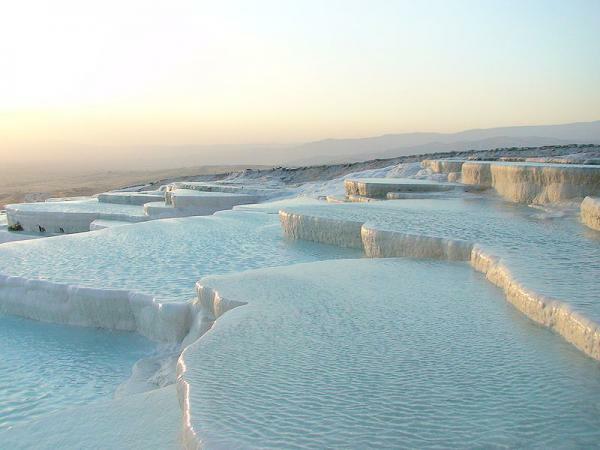 These stunning terraces of water are found in Pamukkale Turkey and were shaped from a substance called travertine, which forms from the build-up of sediments of calcium carbonate deposited in water from hot springs. Then the calcium dioxide degasses and you are left with these beautiful terraces, with warm water flowing over them.